I wasn’t planning on doing a spin-off on the bun post. But this is for a reader by the name of Mike C. Why? Because he asked. (Thanks to you, Mike, not only do I have something to blog about, but I am also equipped with two dozens grab-n-go breakfast baos in the refrigerator.) Also, another commenter, gagz135, mentioned an idea which I had done for quite sometime, i.e. to fill the plain buns with ham and cheese. That’s essentially what these breakfast buns are about. There’s not a recipe, really. It’s just a matter of filling the buns (either the original recipe or the one that produces buns with lighter texture) with the protein parts of your breakfast. A combination of soft-scrambled eggs, cold cuts, and any kind of semi-soft cheese, works well. The cheese is important, because it will melt during the steaming process and “glue” the egg bits and the meat bits together. Without the cheese, your filling will be very crumbly which is fine tastewise, but makes it pretty darn hard to eat without spilling stuff all over yourself. For the batch shown here, I mixed two large eggs, scrambled, with a quarter of a cup each of cubed salami and cubed smoked Gouda (with built-in coarsely-cracked peppercorn). I like the combination of cured meats and smoked cheeses, because it introduces a smoky element to steamed bread which is intrinsically bland. Fire and smoke teaming up with vapor, if that makes any sense. But, of course, you use what you like. Pre-crisped bacon bits are also delicious. If you like a little zip in your breakfast buns, add chopped pimiento or peperoncini. Anything you want, really. Be the master of your filling domain. That’s very creative. I’m planning on messing around with some fruit-based fillings this weekend. But lychee… That has never crossed my mind. Hmm … I think you’ve just an idea in my head. 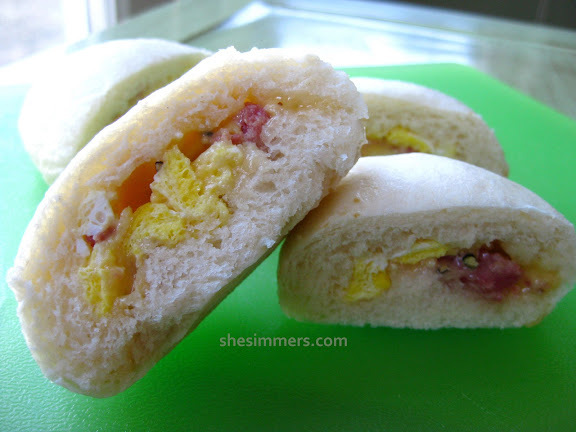 What a great way to combine Chinese steamed buns with ham and cheese! I often take onigiri with me on hikes or to the beach, but these would be great for a morning outing, too. With coffee, of course! Oh, and please let us know how the fruit-based fillings turn out. They sound really interesting! Thanks for the great recipe. I will definitely try that. I’m wondering whether it would be a good idea to mix fruits and chocolat-chips or maybe Nutella oder would the dough soak up the melted chocolat? Everybody, check out Murasaki’s knitting blog! Too cool. Your instinct is right about how the consistency of something like Nutella, when used as a filling to be steamed/baked along with the bread, could be too gooey. The traditional Chinese fillings are starch-based (beans mostly) because of this reason. Your filling needs, to borrow Alton Brown’s terminology, a “dryer” meaning some kind of dry ingredient which will add body to the filling. I once experimented with pastry cream filling and found it to be too wet and runny and cause the bread to be too soggy. I will be posting a few filling recipes in the next week. Please check back. I made these several years ago with a blueberry and goat cheese filling. Excellent! Strawberries or peaches were just as superb. 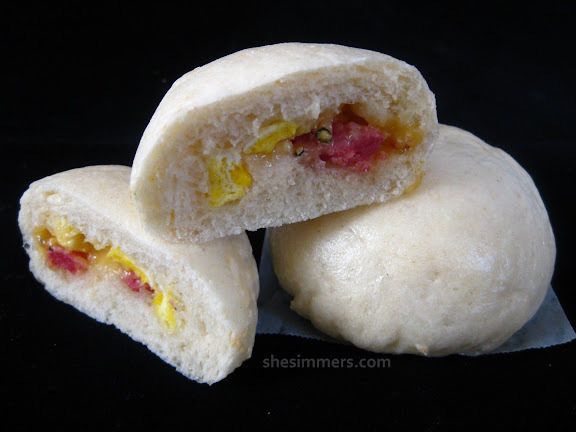 I love the soft, pillowy texture of steamed buns and the burst of flavor inside. Hi! I’ve just discovered your blog after living in Thailand for the last year or so. I’m beyond excited to get cooking with more recipes than the few that I have. I’m particularly excited about Pad Ka-phrao and Phak Bung Fai Deng. I’m wondering–do you cook the scrambled egg mixture before you put it in the bun? Thanks!